Optional:  Axle ratio 12,99:1 * Actual axle load capacity depending on tyre load rating. 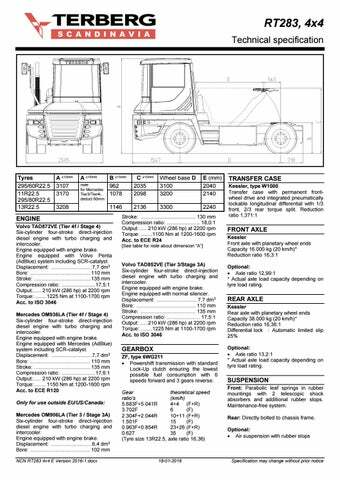 Optional:  Axle ratio 13,2:1 * Actual axle load capacity depending on tyre load rating. Full air brake system with split front- and rear axle circuits. Front axle with Simplex wedge-drum brake system. Rear axle with high capacity twin jaw dry disc brake system. Automatic slack adjusters front and rear. Air reservoirs: 2 x 40 dm3, 1 x 30 dm3. Total 110 dm3. 5th WHEEL 2" Terberg cast steel plate Technical capacity 36.000 kg. Lifting capacity 35.000 kg*. Pneumatic unlocking of 5th wheel, operated from cabin. Indicator light for positive locking inside the cabin. Fully welded extremely strong and stable lifting frame construction. All rotating points equipped with generously sized oscillating bearings. Optional:  3,5“ 5th wheel  Cardanic mounted 5th wheel (2” or 3,5”) *Actual lifting capacity depending on tyre load ratings, vehicle speeds and 5th wheel height. CHASSIS Heavy Duty, torsional stiff, fully welded construction. Air reservoirs and fuel tank protected mounted inside the chassis, fully bolted access steps with anti-slip surface integrated in chassis. Towing pin for 40 and 50 mm tow hitches at front and rear of chassis. 2 Line trailer brake system mounted on rear side of cabin, with yellow and red spiral hoses with gladhands. Air dryer with integrated air pressure regulator. Brake cylinders: Front axle diaphragm only. Spring brake cylinders on rear axle. Brake pressure: 7,8 – 8,5 bar. FUEL TANK Capacity 200 dm3 and integrated with hydraulic tank. COOLING SYSTEM Fin and tube type radiator of heavy-duty construction mounted on rubber silent blocks with separate air to air transmission oil cooler and engine intercooler all mounted side by side. EXHAUST Silencer with vertical pipe. Exhaust system in critical area protected with steel grille. ELECTRICAL SYSTEM 24 Volt negative earth. Alternator (T4f) :28V/100A (110A Volvo) Batteries :2 x 12 Volt / 140 Ah Starter motor :5.5 kW (T4f) Fuses and relays mounted in central electrical box. Can-Bus system allowing multiple options/flexibility and easy fault tracing. All wiring with code numbers and easy readable/visible mounted in easily accessible electrical box. 7 pin SAE socket at rear of cab for trailer connection (DIN ISO 1185). LIGHTING H4 head lights with dipped and main beam and direction indicators. LED rear lights on rear of chassis, with direction indicators and brake lights. 5th wheel floodlight behind cabin. Mounting for rotating beacon light. Interior light in cabin with integrated spotlight.